The Common Dormouse is a nocturnal predator. This animal spends the night in a tree cavity, thick bushes or a nest. These small mammals inhabit deciduous and mixed type forests in all parts of Europe, except Ireland, Finland and the Iberian Peninsula. Common Dormice were often mistaken to be a small squirrel – the animal reaches only 6,5-9 cm in length. Although often thought to be a mouse species, this small animal certainly isn’t one, as shown by the long, fluffy tail. These small animals have a high, squeaky voice and they can emit a variety of sounds, from tweeting to short, shrill calls. Being active only at night, the Common Dormouse can rarely be seen. The mammal has great hearing and large eyes. 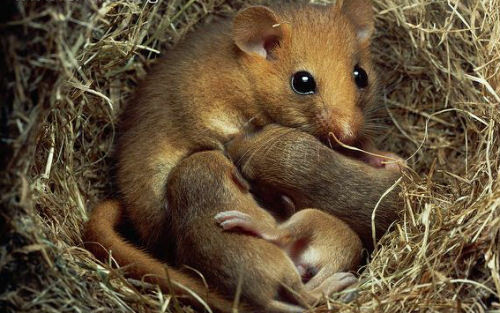 The presence of the Dormouse is given away by the nest – this round structure, reaching a diameter of about 15 centimetres is weaved of grass and leaves and hanged in the branches of a thick bush, or sometimes in a tree or even on the ground. This nest is filled with grass and leaves, making it very warm and comfortable. 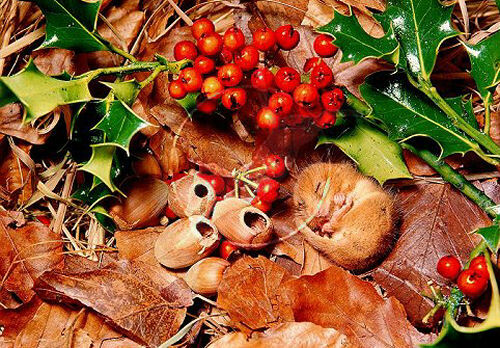 In winter, the Dormice hibernate in their nests, and it usually lasts October through April. Having stored lots of fat, the small mammal falls asleep in the nest, its heartbeat rate slows down and the breathing is slowed too. The Dormouse is so tight asleep that you can even pick it up in hands or move it, without fear of awakening the animal, which would most likely cause its death. Although the Common Dormouse feeds mostly on vegetation, the occasional small animal also becomes prey to the tree mammal. In spring, Dormice enjoy gnawing on sprouts and flowers, while in summer and fall they eat a lot of fruits, berries and nuts. This rodent is very keen on hazel nuts, and their nests are often surrounded by empty hazelnut shells. Apart from the plant life, the Dormouse also eats bugs, snails, worms and other invertebrates. The beginning of the mating period depends on the air temperature. 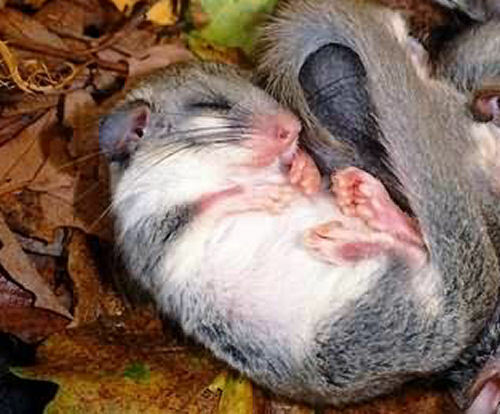 After waking up from hibernation (usually at the end of April), the females create nests. After a pregnancy of about 22-24 days, the female gives birth to 2-4 babies. The young Dormice and blind and completely dependent on their mother. Only 18 days later the young open their eyes and they stay with the mother for 5-7 more weeks, before starting completing independent lives. In total, Common Dormice live for about 4 years on average. In many areas the number of these animals is on a decline, because with the destruction of forests, the Dormice have less and less places to live. Still, many people have become sympathetic towards these small rodents and construct bird nest-like houses for them, which provide great cover for the Dormice, as well as protect them from freezing in the winter. If I could choose whatever I wanted to be, I’d like to be born to be animal. Ridiculously, but it’s happier than to be human.